Imported from the renowned Canchones Stud in Australia, our black stud males, Agenda and Referendum will be available in 2013 for a limited number of matings. 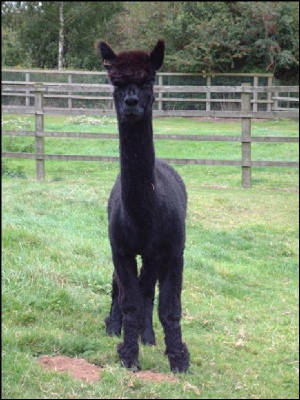 Both boys are true “coal” black, with fantastic fleece, strong bone structure, great shape, and genetics that are highly sort after. They are passing on their fantastic traits and their offspring have been excelling in the showring. Cloud won the prestigious title of BAS National Supreme Champion in 2004. 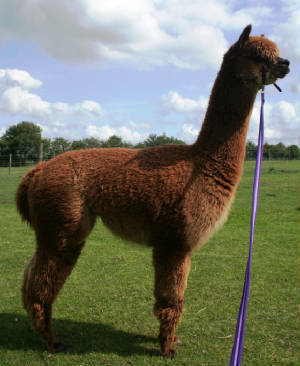 Cloud has an extremely dense, fine, bright and crimpy fleece, with solid frame and bone structure. He passes on these traits, producing stunning progeny that have excelled in the show ring. Currently we have a rare opportunity to buy a half-share in Cloud, contact us for details. 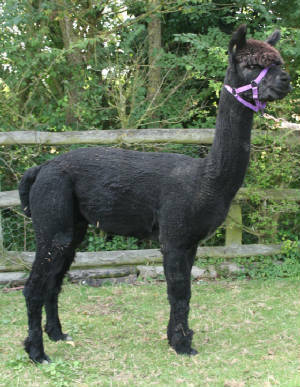 Basil is a stunning, British born, mid brown alpaca, with real presence and excellent bone structure. He has inherited many of the outstanding qualities of his sire, BAS Supreme Champion, Cloud. Basil is a lovely rich brown and is highly uniform in colour, with a fine, bright, dense fleece and a very true-to-type head shape. 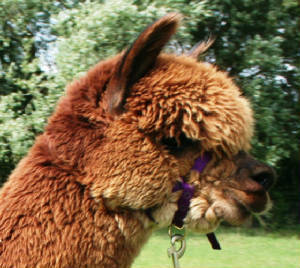 He is a very friendly alpaca and has a lovely gentle nature. We provide choice for your stud services - at our farm (on farm/drive by) or through our mobile service (we bring the stud to you). We provide all the help and advice you need on choosing the right stud for your female. Our stud fees start from £400 + vat for drive by, and we offer discounts for mutliple bookings. Please contact Liz on info@butlersfarmalpacas.co.uk or 07811 353105 for further information and/or to request Fact Sheets on our studs.